Every day, little things happen, that make us laugh, or cry or simply stop and think. For some time, I had been considering toting my camera most days, so I could capture some of these vignettes of life. This has lead to the creation of my blog. Come along with me, an ordinary person, to see what I see, to go where I go. This is Venice, 1980. Little did I know it was to become an obsession later in my life! I do, and I have visited and loved many parts of your country for more than 10 years now. I hope to get there again later this year. HELLO YVONNE ARE YOU THERE??? I’ve dropped Telstra and my ISP probider, bought a 60 GB data package from Amaysim and use my mobile as a hot spot. It’s been good, and half the price of what I have been paying! Thank you for the kind offer, but I will pass on it! You started your blog with much the same idea as me! I wanted to keep a record of things that made me smile, or made me think. It’s fun to read the thoughts of a likeminded person. Hey! Hope all is well? You’ve been quiet. Are you ok? Hello! I just found your comment … apologies to you. I am recovering from a dumb accident I had in Naples, and haven’t had any creative urge whatsoever! Now, I have to get back to Naples and finish my adventures, eh? Hello, and thank you for the link to your post. It’ll make good reading with my morning muesli! Great blog Yvonne! If you like Venice, you might like the post I wrote about our trip there last year! Such a neat city! ok Yvonne—I got to noticing something stange–I said to myself..”self, I’ve not read anything in a long time from my Italian loving Aussie friend… in forever!! !” This coming on the heels of a few other little things I’ve oddly noticed in my little neck of the WP world. Several of those blogs I follow, fell off my reader list as I fell off the reader list of others. We’ve all had to go on recovery missions of sorts. reinstating one another, And this with blogs we all regularly read and comment on. Also I’ve noticed that comments I would make would not show just as others who commented on my posts would not show, those long time friends, as their words were out in limbo somewhere. We’ve mostly all sorted things out—which brings me to the latest sorting. the next time you visit our black sheep friend- could you please tell him that I fear I have either fallen into his spam collection or have simply vanished to purgatory. anyway—i’m happy at least to have re-found your posts!!! as I need a good dose of Italian amore!!! Ciao Yvonne, I really love your blog! Venezia is one of my favorite city in the world. So unique and unreal. Every time I visit this city I just fall in love over and over again! PS: I’d like to suggest you a great book with absolutely stunning pictures of Venice. It’s called ‘Venice Inside’ by Toto Bergamo Rossi and photographs by Jean-François Jaussaud, published by Rizzoli. Check it out, I’m sure you would love it! Italy has so much to offer, but Venice is definitely the queen of the cities. Just wanted to say hi and to thank you for kindly visiting my blog. I look forward to returning soon to read more of your own which looks really interesting. One of the pleasures of keeping a blog, and following others, is that you come across others that you might never have otherwise found. Cheers, Bob. Couldn’t have put it better myself Yvonne. Here’s to future blogs and more friendly banter. Venice. Yes. Mostly in the winter. That’s the best time of the year to visit Venice! Haven’t read all comments, Yvonne, however in six months September 22 we will have visited Venice, Florence, Rome…more I read on your blog, the more I look forward to it. Hope to get back to Courcelette next year. That’s going to be a great trip, Woolly! Isn’t it an amazing city! I just hope something can be done to preserve what they have. The overwhelming hoards of tourists, many of them there only for a few hours, are taking a toll on its very fabric. I’ve had some wonderful experiences in Venice, there’s is always something new around a corner. Welcome, and enjoy your wander. I had already fallen in love with Venice when I was in my early teens. It took me 25 years before I made my first visit, along with Florence. Although Florence disappointed me, Venice took my breath away as I always knew it would. I also knew that I would never want to leave. I made a promise to myself that I would try and return every year, which I have so far. This year might be tricky though as I live much further away than I used to. It took me ages, but I’ve finally begun to see Florence with different eyes. However that darn Venice can’t be knocked off number one spot. I wonder if you’ll get there this year? I was very ill when I went to Florence, it was the middle of summer and there were complications with my original hotel booking. We didn’t get off to a good start. Venice however, treated me very differently and I was besotted. I think the high fevers I was experiencing put a rather fantastical spin on an already fantastical place. She got beneath my skin, and I dreamt about her for two weeks solid thereafter as I fought to get better. This year I am awaiting my provisional Green Card as I have recently emigrated to the U.S. from the U.K., and as yet still waiting. I won’t be able to leave the country for a while to come, I don’t think. This year Venice may have to wait. Oh, it surely will be different, going from the USA rather than the UK. I am so jealous of my UK friends who can flip to Venice for a weekend, for a few pounds! It was very affordable travelling from the U.K. for sure. I shall miss that. I guess we’re all ordinary people writing about our everyday happenings. It’s nice to share a kind of open diary with the world at large. Hi Yvonne. 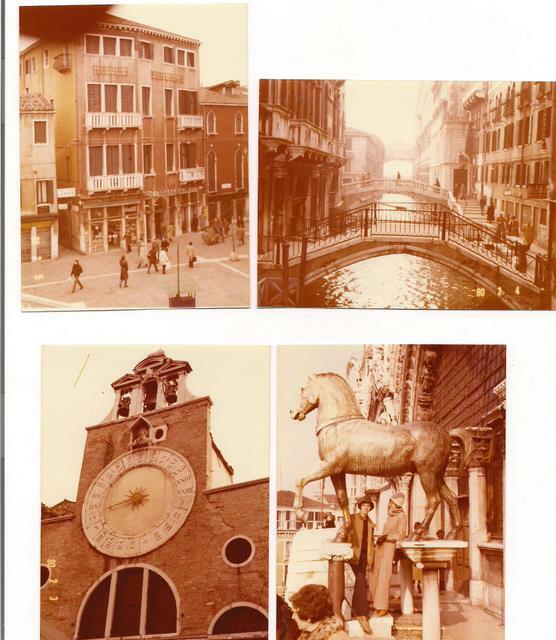 I had my first trip to England and France in in my salad days in 1980 – was that your first time in Venice ? We took the Emmlets to Paris (now I’m up to four visits there … and counting), London, Florence and Rome about 12 years ago – and we dashed over to Venice from our base in Florence. I loved – and still love Florence – and Rome. But despite it being really early in the season, Venice was wall-to-not very far away-wall tourists – it exuded the character of a Disney theme park – without the phoney smiles, but with the serpentine queues. And little things became a hassle – like no public toilets and ridiculous prices and the whiff of water moving too slowly. I was glad to crawl back into our little one star pensione in the heart of Florence. Maybe I had a bad attitude – as a victim of ceaseless house renovations myself, the constant repairs to lovely old buildings slowly rotting their way into the Venetian black lagoon filled me with a sense of hopeless futility. Literally trying to turn back the tide. Not criticising your love of Venice, but curious to hear some more about how you see her. It seems that Venice is a victim of its own charms. The hordes of tourists, blindly following a tour guide, fills me with sadness. And, I don’t think the local Venetians benefit much from this influx, unfortunately. In fact, they are being priced out of their own accommodations and having to seek more economical rentals on the mainland. I don’t know what, if anything, can be done to preserve the Venetians and their lifestyle, let alone the buildings slowly mouldering away, coated by ugly scrawls of graffiti. I first went there in 1980, I wish I could remember what it was like then! Even since 2008, when I began to go there on a yearly basis, I’ve seen an acceleration of the decline of this once proud city. What draws me back is the friendships I’ve made there, and the little precious places you can still find, far away from tourist central. I like Florence very much, but not as much as Venice! Its always fab to discover another Venetophile!! I’m so obsessed with the watery city that I moved over there in 2014 and have been there for 18 months so far…..it never gets boring does it?! Next time you come over, maybe we should grab a coffee! Keep up the great work!! I’d really enjoy that. I’ll be there from 1 December to 22 January, so let’s meet, for sure! From my apartment, I’ll be looking at Signor Cacalibri! Seems a pretty healthy obsession as obsessions go. Good morning! Thank you for the nice compliment. I have stopped accepting awards, but I am pleased you think I am worthy. Now, I have to go and read what you have written on your blog, after accepting your nomination. No, it’s lovely to be remembered. I followed your link from Midi Hideaway and thought your blog was sensational it reminded me so much of what we saw in Northern Italy and brought back such fabulous memories.I am just starting out as a travel blogger and still trying to figure out how to set my blog up.Thank you so much and keep travelling. Hi, Susan. You must be another Aussie! Thank you for your nice words. Sometimes, the posts write themselves, other times you struggle. It’s so nice when you get a few active followers who aren’t shy about leaving comments, that brings things alive! Good luck with your blog. Yvonne, keep doing the good things that you do! Thank you, Brett. Every once in a while I think “That’s enough”, but blogging does get to be a tad of an obsession with many of us, it seems. A pleasure to meet you. I’m glad you liked my comment on Doug’s (aka Weggieboy’s ) blog. We seem to have a running thing going where I’m always sticking up for Andy and Dougie over him. Hello, nice to meet you too. Those cats are very special, aren’t they? Oh, Janey, I just found you in the spam folder! So, I’ve hauled you out, dusted you off and plunked you in the right place. What a treasure this blog is! Not just another shutterbug, but one with imagination along the way….Glad I found you! Well, thank you! When I started, my aim was not to do the usual (although beautiful) photos everyone seems to do. It has made me open my eyes, and slow down and look around! Thank you. Every time I think “Enough”, something comes along to give me a nudge. Uh-oh, now I have to put my thinking cap on and do some work! I love these candid shots of people doing ordinary and extraordinary things! Same here! We have such curiosity about other people, it seems. Thanks for the visits and like on my travel blog. You remind me that I need to revisit Venice. I hope you do get back there! We’re doing the harder stuff first, but I know I’ll get there. Thanks for the follow, and I’ve reciprocated. Your posts are fascinating. Thank you, Ma’am, I think the same about your posts. You and Poor John have done some extraordinary travels! I look back on my old posts and can’t believe how lucky I am to have seen and done these things. Every time I go to Venice, it rains. I’m not joking. Hey there Yvonne! Just stopped by your blog randomly and gave it a follow. Visit me if you’d like to see my crazy world: http://www.thatssojacob.wordpress.com. Thanks! Well, it’s nice to have you here, Jacob. I have visitors for a couple of days, but I’ll be back to look at your blog on the weekend. happy New Year! Venice, an obsession? Snap. I was first there in the 1960s. It would have been quite different in those days, Hilary! Thank you so much for visiting my blog and following it. Looking forward to see many more stories and images here. Hi, and welcome to you, also. Thank you, Francis! It would be really nice to meet you folks along with Debra. I’m in Florence for 2 months, so I’m sure we can organise something. I enjoy your blog, and Debra’s, very much! Which months next year will you be in Florence? I will be in Italy from mid Feb until mid June and I am often in Florence. Perhaps we could have coffee at Giacosa or lunch at Obika…or both? That would be excellent, Debra. I’ll be there for 2 months, March and April. I look forward to meeting a fellow Oz! I think I’ll enjoy digging around in your archives, rather like an archaeologist! Ciao, Stefy. Yes, I’ve visited ( and liked) Rome. Next year, I’ll be in Florence for 2 months, then Venice for one month. 🙂 Abbracci a te. Wow, two months in Florence ! It is a beautiful town! Quindi parli bene l’Italiano;) Ciao. Stefy. I’m really pleased to have found your blog, I’m an Italian living down under at the moment and I so enjoy reading/watching your posts. Ciao! What part of Italy are you from? And, how long will you be here? Hi 🙂 I’m from Milan and I’ll be in Melbourne for another 2 years. Are you in Melbourne too? No, I live up in northern Queensland! I go to Italy (mostly Venice) almost every year. Next time, I’ll spend longer in Florence, then go to Venice again. Glad to have found the blog of someone obsessed with Venice. Me too. I’ll be following. Thank you for following me. It will be a pleasure having you along for the ride! Thank you! There’s such a diversity of topics covered every day out there in the world of blog-dom! Thank you so much for following our blog 🙂 Will definitely have a trawl through your blog – looks like we will like it here! I’m getting deeper and deeper into the world of blogdom. There are so many good blogs out there, to discover and enjoy! Or, we don’t have the darn camera with us! I got to your blog via another, which one I can’t remember just now, of course! See you around! I ALWAYS have my camera on me, it’s a compulsion I developed since I started blogging. I never had one before, and I don’t even know how to use my phone to take pics, lol. I bought the camera under duress, coz I thought blogs without any pictures are boring. (Not always true, I hasten to add). Yes!! What will we do when she moves to Germany? But, I’m sure she’ll find fodder for her blog there, too! And, I look forward to your future posts. I admire your city, very much! I may see you next spring. And, I sure like yours. I’ve never known anyone with such a large family of cats! Hi- How funny– we clicked on follow at the same time. Thanks for following my photography blog, Jane’s Lens. I hope you are inspired. Your blog is beautiful and I look forward to more. Ha. I love your sense of humor. Happy shooting! Thank you, Sonia! I just had a look at yours, and the post that came up was the fascinating one about the social weavers. Thank you! I have much preasure reading your words and seeing your stunning pictures! Ciao Yvonne, as you know I changed my site, I’d really appreciate if you can update the link in your blogroll. Ciao! thanks for reminding me. Let me know if it’s not connecting properly. Jack’s Mom thinks you are as cool as Jack does. You are officially the FIRST blog I want to / actually plan to follow. Love to you from your other Canadian friend. Hi there, yourself! And, you’re welcome. I’m always pleased to stumble across another interesting blog! Hi, and welcome to my blog. You have no doubt figured out where my interests lie. I’ll be back to read more, I’m enjoying it very much. I have 2 nice friends from Scotland who are ESL teachers in Venice, they’ve had some interesting experiences along the way. Hi, Julie. I had noticed (especially on the Door Whore blog), that Italy sneaks into your posts. I laughed about the Sophie Loren love-child connection! Thank you, Carol. The light in Venice this time was very subdued most days, it rained so much! Hi Yvonne, and thank you for following my blog!! I’ve not yet made it to Venice, but it’s on my “bucket” list – I hope to get there soon, and your blog is going to be very interesting reading in preparation! Hi! When you do get to Venice, I’ll be interested to see what you have to say about it on your blog! you always “like” my posts but only now I see how nice is your blog! I’ll ask you to forgive me adding your blog to my Blogroll. HI, I nominated you for Very Inspiring Blogger award here http://praguebykaty.wordpress.com/2013/03/22/praguebykaty100/, beacuse I think your blog is really stunning. And once you are there hopefully a wonderfully fast high speed internet connection like I had. I really miss that. Mine here in Seattle is so slow in comparison….same Netbook…slower speeds here. Guess I need to upgrade. Buon Natale, Yvonne. Thanks for keeping this up for all this time. Looking forward to your new posts from our beloved. I’ve got me a new, larger, faster ultrabook to keep me company in Venice, Michelle. Many thanks for your posts that bring me closer to my beloved Venice. Merry Xmas! And, a very happy festive season to you, Jon. When can you get back to Venice? Hi! I sat down and read all your posts, I’ll follow your adventures with interest. You’re in an great part of Florence. Auguri! Thank you for your blog and your enthousiasm for life. I have sent you an email with the link to the site where I got the name of these structures. Chilly Canada is my home. Australia…… another wish. Maybe a good sgroppino one day! After retiring recently I have had more time on my hands. I recently found your blog, what a treasure!!! Thanks for sharing your incredible knowledge. My name on another site is Hooked, a reference to what happened to me on my 1st visit to Venice. I was hooked, reeled in like a fish on a line. When I’m not in Venice I’m just waiting, impatiently 🙂 for the next time I can bite that hook. Until then, thanks for the window into your blessed life in Serenissima. Welcome to my blog. I am back in Australia again, but will continue to post. How does that Venice do it? She captures so many people with no effort. Maybe our paths will cross there, one day! Hi, Al. It’s nice to welcome another lover of Venice! And, we’re fellow Queenslanders, it seems. Now I’ll have a look at yours to see what’s happening back home. I first went to Venice in 1963 and it has become an obsession with me, as well. I have been there many times and have pictures in every room of my house! Thanks for sharing..
My goodness, that is a long term obsession!! There’s so much to see and marvel at, isn’t there? How long are you here? this is KZ by the way!!! what a pretty cat and what an amazing thing to get to see!!!! they are real craftsmen aren’t they. KZ!!!! What a surprise! I’m listening to good old ABC Classic FM right now. I little touch of home. XXXX to you, Fb and the beasts. Hi, Barb, nice to see you on this page! You’d really like Venice right now, so cool and crisp. Still too many flippin’ people around, though, and they’re definitely not all Venetians. Love the 1980 photos! Keep up the good work. Whether it’s about Venice or Australia, I want to “follow along”. Bonjour Yvonne, comme vous j’ai connu Venise en 1980 et depuis je n’ai jamais cessé de l’aimer, passion ou folie je ne sais pas, mais j’adore cela et je pense que cette maladie-là ne me quittera jamais ! Buongiorno! Yes, what is it about Venice that gets right into our very heart and soul? It is a mystical place, that reveals itself little by little. A presto! Man, this blogging is a big learning curve. Don’t worry. No one seems to look at this part of my blog .. it’s our little secret! Hey, 177 days now. A mere nothing. I’m busy knitting scarves, hats, mittens …. Okay, I’m sorry to bother you again, but I figured out how to at least repost your comment from today. The others are long gone, but, well, at least not every single one… Please delete this comment and my previous one as this space should be devoted to expressing how interesting your blog is–and it is– rather than blabbing on about my own incompetence! I just tried to “address” your difficulty in leaving comments on my blog and instead only managed to somehow delete in one fell foolish swoop something like all of the last 30 comments left over the last I don’t know how many entries!! I fortunately have at least the last entry you posted today on my gmail account and even my response to it (also deleted) on my gmail–BUT I can’t put either of them on the blog as comments again. Can you repost today’s comment? Do you have it somewhere? I think I actually–after making a big mess–changed something that should allow you to post readily. If you don’t have what you posted and would like me to email it to you so you can re-post it, you could let me know that in your comment & then I’ll try to figure out how to get you my address…? Oh, no. What a disaster! The wonderful world of blogdom, eh? Crumbs, I hope you can get things sorted, Steven. Looks like you are an expert in this field, great post and keep up the great work, my friend recommended me this. Hi Yvonne: Gay sent this on to me. Fantastic! You look terrific! Thanks, Norma, what a nice thing to say! Ciao Bella Yvonne, I love your blog! AliDa is enjoying your blogs very much as well! Silkie is enjoying your blogs! Grazie, bella. Now, we have to get you to start yours. Randallo (I’ll get it right one day) can help you!